This made in Ontario innovation allows local businesses and commercial property owners and tenants to join together with the support of their municipality to organize, finance and carry out physical improvements and promote economic development in their district. Every person who owns commercial/industrial property or operates a business within an area designated as a business improvement area is a member of the Business Improvement Area. 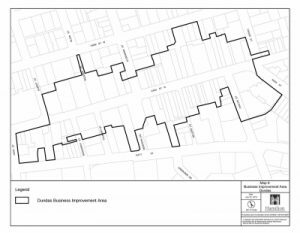 Are you in the Dundas BIA Boundaries? Our area is King St from 1 Cross Street to Albert Street on the North side of King Street. Grafton Square at King and Main to John Street on the south side of King Street. Also in the geographical area is 6 Cross Street, 12 Miller’s Lane, 7 John Street. The Community Sign Board is provided by the Town of Dundas and is organized through Dundas Community Services. 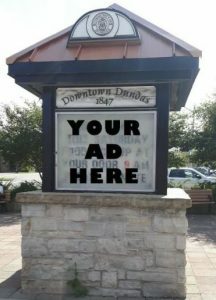 It is provided for only non-profit organizations or groups in Dundas to advertise and make the community aware of upcoming events or programs.